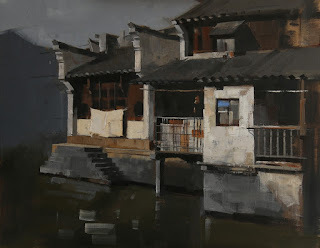 "Wuzhen Canal 2 (Day 2)"
This is my Second painting of my "Wuzhen Canal" series. It is a 24" x 24". I paid special attention to the color harmony. It is so sensitive when I paint Chinese landscapes, because the color of grey is so subtle. If I am not care enough it goes to mud so easily. At this moment the painting is still look mechanical. Additional information is needed on the edge treatment to make the painting more painterly and dramatic. Quite a few years ago, I did a small 6"x 6" with the small ref photo, but now the large version really much stronger impact. I did this head study last night. I felt happy about it. It is 4th head study of the year. The progress is noticeable. I paid attention to the solidity of the head. I can't wait to paint my next one next week. This week, I have been working in my garage since my studio is not large enough. I am working on 4 large painting simultaneously. I have the feeling that I am a real full time painter now. Of course, I have been working full time for my art about four years now, but I have not had this kind of concentration before. Somehow I feel this kind ideal working condition will end soon. I really treasure this luxury. "Wuzhen Canal 1 (Day 2)"
This painting has been progress very fast. I have given almost all the details it needs. It may need more edge work and color accents, but I am close to the end of the painting. Compared with my downtown Austin painting (which takes me close to 20 days), It is amazing. I am going to start another large painting very soon. I really enjoy my current mode of painting. Quiet and involved. Painting, and painting only. 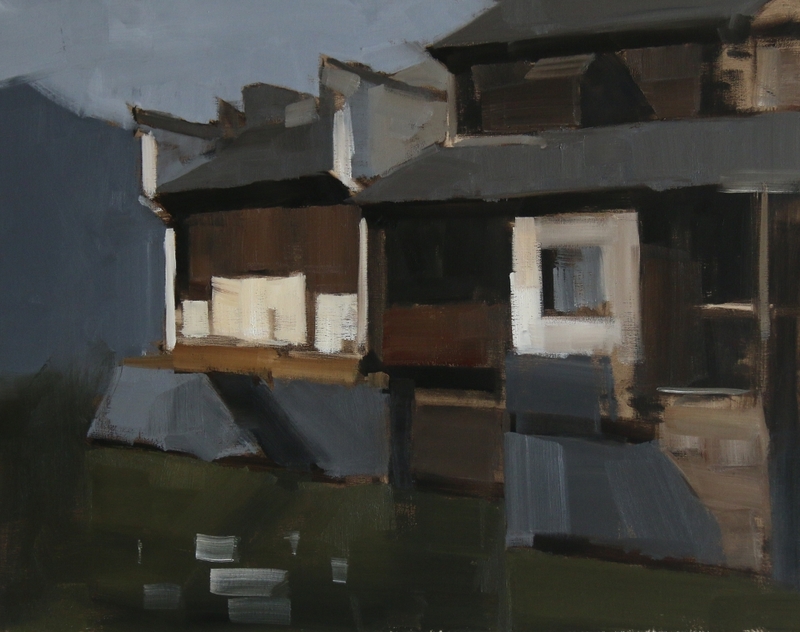 "Wuzhen Canal 1 (Day 1)"
I have started a few large paintings simultaneously. This is one of them, size 22" x 28". 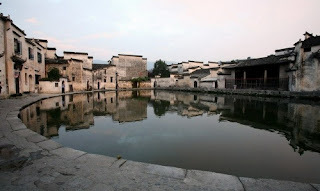 It is based on a photo I took a few years ago at Wuzhen China. It is in a early color stage. It may take me a few more day to finish this painting. I have noticed and not surprised that nowadays my online traffic to my blog has been significantly decreased. I have entered a relatively quieter time of my art career. My feeling is mixed. One side I feel I can relax a little because I don't need to reply as many emails as I did before. However, on the other side, I do felt a little lonely now. People have seen my art for so many years, their interest is no longer as high as before. It is a very understandable situation. I feel I am a lonely sailer, waving to all my friends at the port. Now the land is getting afar. I am by myself only surrounded by the vast ocean. The journey is long and unpredictable. It is beautiful and a little scary around me. What I need to do only is keeping on going, going, and going more. I am having a great time these a few days. You can see I am painting everything: plein air, still life, and portrait. I am investigating and learning like a sponge. This is the thing I really want to do. I don't care much about establish a name and making a lot of money. What I really care to do is painting itself. I want to paint well. I went to portrait painting last night. Our model had a long day and felt very tired. She hardly could keep her eyes open. So I concentrated on her nose and mouth. I used only raw umber and white for this painting. I don't worry about color. To accurately present her facial features was my objective. "To get a good composition, do not put the object right at the center of the canvas". It is not true. I like what I have done on this painting. Earlier of the year, I have announced that we will do our 2nd China Painting trip this September. Now I want to officially say that this trip is a "GO". Currently, we have 8 people in our group. Travel to China this year has a few advantages than what we had two years ago. First of all the airfare to China this year is significantly lower than that of last year. Secondly, Chinese embassy starts to offer 10 year visa for Americans. With a relatively small group of people, the trip will be more enjoyable. It is not too late if you are interested in joining us to tour and paint in China. Please check my China Painting Trip Website for information and signing up. If you have not planned your vacation this year, you may consider to join us for this fun trip. I am looking forward to traveling and painting with you in this old and exotic country. You must have noticed that I have stopped painting small daily paintings for about a year by now. However, I want to restart again. This time I want to concentrate on plein air landscapes. I have not practiced enough on painting plein air. I always want to place regular shaped 3D objects, like a house, or other man made structures in my plein air. That is the reason I prefer cityscapes rather than pure landscapes. Well, this one is my exploration of trees and bushes. Coming back from Ann Arbor, I finally feel I can relax for a relatively long period of time. My next workshop teaching will be in middle of June. So I can stay at home for more than a month. What a luxury I am having. I can paint and study in my own pace. I went to live painting yesterday. Having not paint human faces for a quite a long time, (this is my 2nd head study of the year) I feel really rusty. Not long from now, I need to involve portray painting into my workshop teaching. So I really need to do more this kind of studies to improve my portrait skills. My 2016 workshop schedule now is available on my website. Similar to 2015, I teach 2 workshops per month in average. I will travel all over. If you are interested in learning my painting techniques, please select the workshop near you and contact the workshop organizer for detailed information. For these a couple of years, I have seen more and more people coming to my workshops. Many places have long waiting lists. Therefore, please secure your seat as early as possible. I will see you in 2016. This is my flower painting demo on the workshop. I have been doing this kind of mid key flower demos consecutively in my still life workshops since this February. It feels that it is a good direction to go. At this moment the composition and flower types are still lack of variation, but it starts to develop into a style I like. I would like to move on and get better. The second demo on the workshop I have involved a pewter horse figurine. Placing a new type of objects in my demos is a way I combine teaching and learning together. Sharing something I know is my duty as an art teaching, while sharing my struggle of problem solving is showing myself as a regular human being. I am on the same boat of my students. We are experiencing the same learning process to fulfill our art dream. My 10th workshop of the year happened at Ann Arbor Michigan. I want to thank Debra Zamperla for organizing and thanks to artists from all over for attending. It is beautiful spring time in Michigan, but I am still doing still life paintings indoor. This is my first demo. I hope you like it. BTW I start to explore more about social media management, and try to sync Blogger, Facebook, Twitter, LinkedIn, Instagram, and Weibo all together. I am trying to use "Hootsuite" Social media dashboard. If any of you using this tool or other tools, please let me know. Thanks. I have just opened a Hootsuite account in order to sync multiple social media all together. I am testing this new internet tool. So far I only know how to post text but not image. Do anybody know how to post images on blog from Hootsuite? Please help me out. Thanks. I am very happy to know that my painting "Heavy Metal" has won the "Still Life Honorable Mention" award on the recent 24th Oil Painters America National Exhibition. This is my second time winning this award. I want to thank OPA for giving me this honor. I was so happy meeting the contemporary oil painting master Main Situ. I have been admire his fantastic figurative work for many many year. Finally I met him in person.